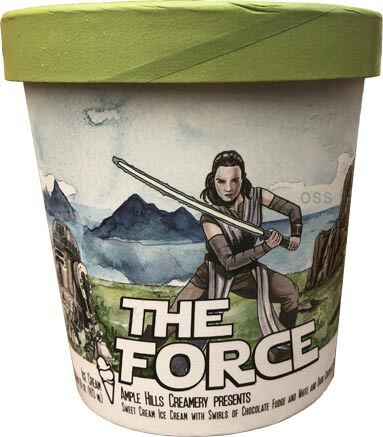 [By Nick] A long time ago in a freezer aisle far, far away... Actually it was last week at my local Whole Foods that I spotted the Ample Hills x Star Wars collaboration while waiting to go see Black Panther. (Not a movie critic by any means but it was one of the best marvel movies to date!) I was honestly surprised to even encounter Ample Hills outside of NYC let alone 6 pints including these 3 pints. As you know, Dubba and I are nerds, so I was definitely excited. However, the $9.99 price tag left me conflicted. Did I want to review these flavors for you all? Yes. Did I want to spend $30+ on 3 pints of ice cream? Nope, that’s just insane to me especially when I’ve been making my own ice cream as of late. Thankfully the kind folks at Whole Foods hooked me up with the trio to try. So let’s plunge into deep space and kick this review into hyperdrive! We’ll start things out on the dark side with our Sith friends in the First Order. From the start, this one seems a bit uninspired. However on the side panel it notes that there’s also a dash of powerful espresso. So maybe this one will be a little bit more interesting than expected. Can’t always judge a book by its cover. Next thing you know it’ll blow up Hosnian Prime. Removing the lid, this one seems to have gotten a little freezer burnt. It must get extra cold at night in the freezers of the Death Star. The whole pint wasn’t affected though. 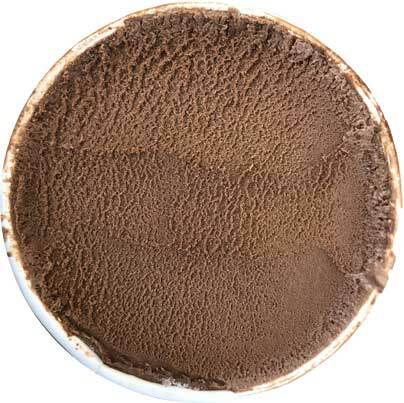 After removing the top layer, it looks like just about any other super premium chocolate ice cream ever. The taste and texture isn’t much more different. Yes, it’s more robust than your standard chocolate offerings. The chocolate isn’t as bitter as I was expecting which is a plus. There’s a deep richness to the flavor profile but that’s about everything that’s going on here. The salt is nonexistent and as far as the espresso goes, the Supreme Leader would be very disappointed in its power. 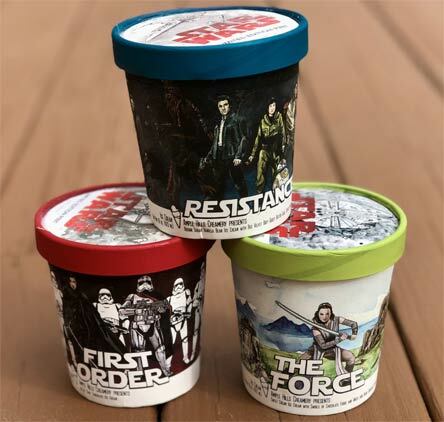 This flavor would never come close to tempting me to cross over to the dark side. Okay now that’s what I’m talking about. This one is a bit more interesting and I like what they did representing the light and dark sides with the white and dark chocolate pearls. If you want to dig deeper into the nerdocity, the swirls of Chocolate fudge could be the force flowing through someone’s body. Okay, that’s enough of that. Let’s use the force to take off the lid. This is a pretty looking ice cream. The swirls of fudge look like one massive swirl but I have no problems with that. You can make out the dark chocolate pearls easily but have to really look close to see the white chocolate ones. The sweet cream base is perfect. Everything you’d want in a base. Milky, sweet and all around creamy. 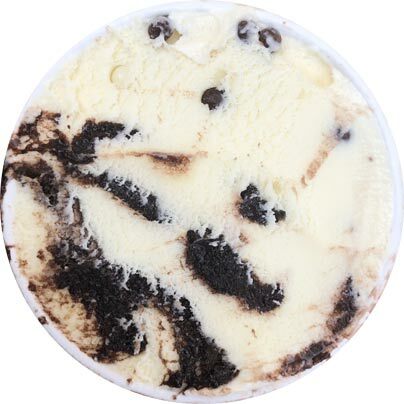 The fudge swirl is rich, thick and adds a nice contrast to the sweet cream. It’s one of the best fudge swirls I’ve ever encountered. It almost has a caramel like gooey quality to it which is amazing. Sadly, the pearls are a bit of an adorable novelty and that’s about it. They’re cute but the flavor they add is minimum at most. They do add a pop of crunchy texture here and there which is nice and all. That’s just about all they add though. Luke wouldn’t see much of a threat with the force this one holds within. Lastly, let’s stop in with our friends in the Princess Leia backed Resistance. There’s a lot going on here in this little pint. 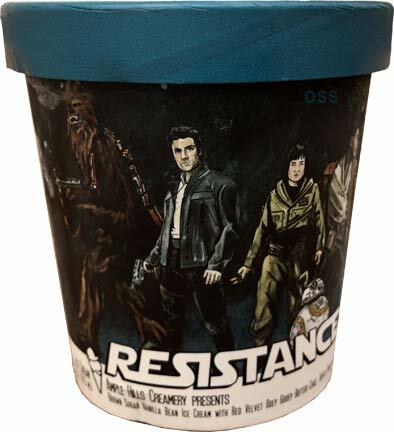 I mean the resistance is a very diverse crew (there’s an ex storm trooper for Han’s sake) so it only makes sense that this will be a mashup of flavors. 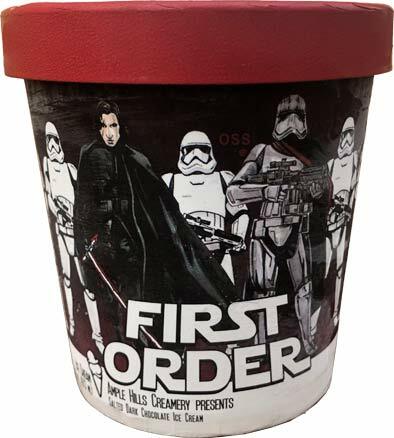 Just like The Force, this is a pretty looking pint. It’s known from the start that this is going to be a mix-in heavy pint. The flavor of the base is familiar albeit a little weird. I don’t know if there’s a little too much brown sugar going on messing with the vanilla bean but it just feels a slightly off to me. Not in a bad way, it’s just different. The red velvet in this pint is the star by far. It is the most ample amount of mix-ins in the pint and I have no issue with that. It lives up to the name and more. This cake is the definition of moist which is something you can’t find too easily in the ice cream world. Dense, gooey and all cocoa deliciousness. The amount of the cake pieces in this pint are ridiculous. It almost makes you forget that there’s supposed to be two other mix-ins. 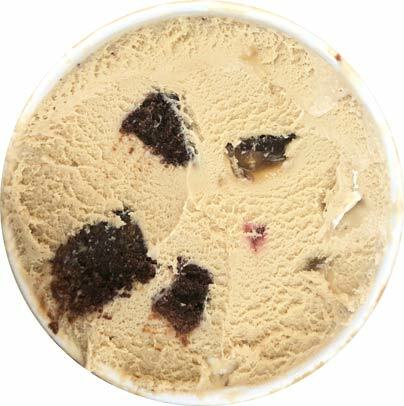 The toffee adds a nutty, crunch to the pint that add a much needed cut into the sweetness of the flavor. The marshmallows are more irrelevant than Jar Jar Binks. I don’t think I encountered more than two in the entire pint. The Red velvet rules this pint and there’s no denying why. They’re one of my overall favorite mix-ins in existence. This was definitely a treat and a fun review to write. However, it’s hard for me to fully endorse any of these at their full price. If you’re close to an ample hills scoop shop, the Resistance and the Force are worth a scoop. You can pass on joining the dark side. As for retail, I could only say the Resistance would be the most worth your money. Thanks again to Whole Foods for the hook up and Ample Hill & Star Wars for making this nerdy ice cream partnership a reality. The Resistance: Long live the Red Velvet Ooey Gooey Butter Cake! Basically yes, though Nick would have to give you the exact specifics. So the third one is called "The Resistance" for the diversity huh? You sure it's not referencing "Insulin Resistance"? I mean, Jeez! The sad part is, that's the only one I'd be willing to try because I'm a sucker for cake-themed ice cream and the other 2 just sound so boring. I typically do not pay $10 for a pint of ice cream - but I have let myself splurge on my birthday or for Christmas. I’ve had Ample Hills at their scoop shop while in business in NYC, and I’ve ordered it once. It is excellent ice cream. I thought some flavors were a bit over hyped - but others blew my mind. The quality does exceed super premium grocery store ice cream. That said, some of these flavors would not merit $10 to me. But their peppermint patty or pistachio squared or ooey gooey butter cake or nonna d’s oatmeal lace cookie or the commodore are awesome. Oh, man. I love Ample Hills and was so excited to try The Resistance, but the pint I got from the UWS Whole Foods had not a single chunk of anything in it. Just straight-up brown sugar ice cream. I want to give it another go, but once bitten, twice shy, especially at $9/pint. I'd buy The Resistance. It sounds good. Anon #1, I wish they were a little bit more creative as well. Ben, that’s saddeninf. I’d honestly write to them because when you’re already paying such a premium price and that happens, you deserve a refund or a new pint.